How much does it cost to travel to Rio de Janeiro? How much money will you need in Rio de Janeiro? R$395 ($100) is the average daily price for traveling in Rio de Janeiro. The average price of food for one day is R$65 ($16). The average price of a hotel for a couple is R$528 ($134). Additional pricing is in the table below. These average travel prices have been collected from other travelers to help you plan your own travel budget. How expensive is Rio de Janeiro? How much money do I need for Rio de Janeiro? Rio de Janeiro is the most popular travel destination in Brazil. It is the second largest city in Brazil and the sixth largest in the Americas. A portion of the city has been designated a World Heritage Site. The peak time to visit is during the city's famous Carnival festival, which is one of the most famous festivals in the world. However, Rio's appeal as a travel destination is apparent year around. The city has a wonderful natural harbour that is surrounded by Sugar Loaf Mountain, Corcovado Peak, and the hills of Tijuca, creating an absolutely breathtaking and awe-inspiring setting. And you can't miss the beach, either! Rio has a climate that is similar to a tropical monsoon climate. Between the months of December and March, extended periods of heavy rain are not uncommon. Temperatures in the inland areas can climb above 100 degrees Fahrenheit during the summer months and highs are typically in the low 80s. Rio is known for its beaches. They are wide and beautiful with soft white sand. The main beaches are between Leme and Barra and there are many services available to visitors. There are also beaches on the island of Paqueta such as Praia da Moreninha that are worth visiting. In addition to the many popular beaches, Rio de Janeiro has some great sights that you should make a point of visiting. The Streetcar of Santa Teresa passes through a very scenic neighborhood. Parque Lage is a small park with a mansion that has been converted to a school for fine arts. Jardim Botanico is the botanical gardens that have existed since the 1800s and the National Museum of History is downtown and covers a range of information about Brazil history. One of the most recognizable spots in Rio is on Corcovado Hill. The landmark statue of Cristo Redentor (Christ the Redeemer) is truly amazing and the view is breathtaking. There are several ways to reach the top of the hill but the most popular is the funicular train. There are four main districts in Rio de Janeiro. Centro has the business and financial districts as well as some interesting museums and sights. The South Zone has many upscale neighborhoods and many of the tourist areas including Copacabana, as well as Sugar Loaf and Corcovado Mountains. The North Zone has the stadium, zoo, and a handful of other interesting sights. The West Zone is a growing suburban area that is most popular for its beaches. This is also the area that will house most of the 2016 Olympics. Carnival is easily the most famous event in Rio. This is the most crowded, but interesting time to visit the city. The event lasts two weeks and includes many parades and events that go well into the night. The streets are filled with music, dancing, and festivities and it truly is a once in a lifetime experience. 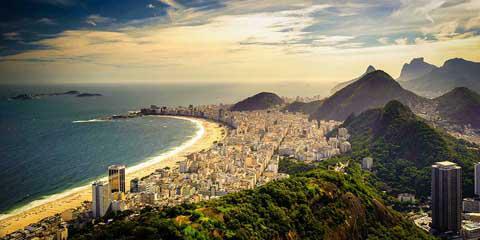 Other activities in and around Rio include hang gliding, paragliding, hiking, and dance lessons. Rio de Janeiro has a wide diversity of food options. Local food is often available at buffet style restaurants (comida a kilo). Prices are by weight. There are also all-you-can-eat restaurants that serve grilled meats and vegetables. Servers bring the dishes to tables on skewers. This style of cooking, called rodizio, is also available for seafood, pizza, and snacks. Brazilian specialties often include seafood such as shrimp, lobster, calamari, and shellfish. Juice bars have also becoming very common and fruit juices are available of all types. Dias Ferreira Street, in Leblon, is the city's trendy restaurant row. Restaurants are a little more expensive in this area, but are usually quite good. While there is a metro and bus system, generally the easiest way to travel through Rio de Janeiro is with a taxi. Official taxis must be yellow with a blue stripe down its side. Cars that travel special routes, such as to the airport, may be a different style. Generally the prices for taxis in the city are reasonable, but distances may be far. It's also possible to hire a taxi for a day's tour. This will typical cost around US$20. Buses are the cheapest way around town and they are relatively convenient in the city's South Zone. This is where you'll find the most bus routes with the greatest frequency. Buses also have their own designated bus lanes so travel times can be shorter. During the night hours buses are less common and not as safe. The Metro Rio is safe and comfortable. There are two lines, Line 1 (Orange) and Line 2 (Green). Some stations run buses into the nearby neighborhoods, making the system slightly more convenient, even if you're not in walking distance. The last car of each train has a pink window sticker during rush hours to indicate that the car is women only.